With LASIK we make changes to the front layer of the eye. 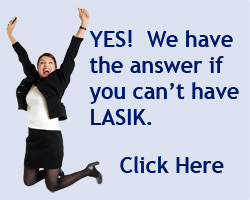 The advantage of Epi or Surface LASIK is there is no cutting. So you have all the benefits of LASIK without the potential risks. To understand how this is possible we need to take a close-up view of the cornea. This is a view of how the cornea looks under the microscope. The cornea is actually a sandwich of layers. The surface layer is called the epithelial layer. It continually replaces itself every few weeks like the cells on the surface of you skin. The deeper layers are permanent and do not replace itself. This deeper layer is what we make changes to with the laser. 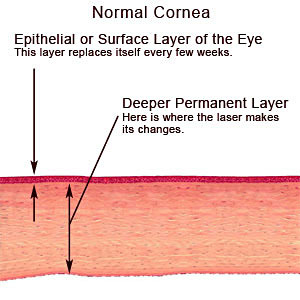 Because this layer is permanent we can correct your vision with the laser and the changes are stable. You can expect making a safe LASIK procedure even safer. You will experience less eye dryness. Less worries about the flap healing with wrinkles or distortions. No concerns about bumping the flap and damaging the vision. With Surface LASIK the first few day of healing and quality of vision are a slower than standard LASIK. For most patients it is best to do one eye at a time so as to not interfere with your normal activities and working. For that effort a patient has the safety and security knowing the serious negative risks of LASIK have been eliminated with Surface LASIK.